My Hero Academia's Joint Training arc has seen more of a focus on developing the students of Class 1-A and Class 1-B following the events of the last few arcs, and one of the main things it's been teasing is the much anticipated rematch between Midoriya and Shinso. After Midoriya defeated Shinso during the Sports Festival, Shinso has been preparing in secret and might be on his way to entering the Hero Course officially. But in order to do so, he needs to finish the battle with Midoriya, which officially kicks off in Chapter 214 of the series. 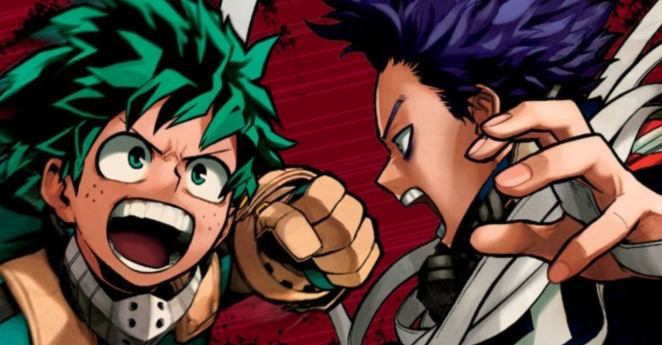 Over the last few chapters of the series, Midoriya and Shinso have been waiting to kick off their rematch as their groups have been pitted against one another. But it's been delayed by Midoriya's One For All going out of control. Luckily, Uraraka and Shinso actually helped Midoriya to snap out of his fervor and get One For All under his control (even when he realized he has more Quirks at his disposal as the result). But Shinso has been training since his last appearance in order to truly fight against Midoriya in a fair rematch. In Chapter 214, this rematch begins due to Aizawa letting them continue their test after Midoriya's One For All stops rampaging. Midoriya and Shinso still want to fight, and Midoriya gets to the high place Shins is standing thanks to help from Uraraka's gravity quirk. When Shinso attempts to help Monoma, Midoriya grabs onto Shinso's binding cloth, and Shinso is all too happy to counter it. Shinso, ready to counter, uses his binding cloth to pull down some steel pipes in order to bring Midoriya down. Though, Midoriya uses his newly unlocked Blackwhip quirk to catch them in the air. The chapter comes to an end before fans get to see how Shinso reacts to this, but it's probably not going to be well. Shinso, though beaten by Midoriya during the Sports Festival, used that as a learning experience to prove that he can be a hero through sheer work and practice. Aizawa's been training him how to use the binding cloth in order to give him a way to fight as a hero, and if he can beat Midoriya here then it will show just how much he's grown since fans have last seen him.